Having recently had the privilege of visiting Europe, I was gratified to find myself in a great many churches and cathedrals, many of which have stood in some form since the Middle Ages or the Enlightenment. In only rare instances were these buildings not absolutely magnificent works of art in every respect: from the architecture, to the stained glass, to the sculpture and the paintings. If there is one thing the United States lacks, it must be a rich, complex history spanning millennia; nothing, save the ground itself, is very old. 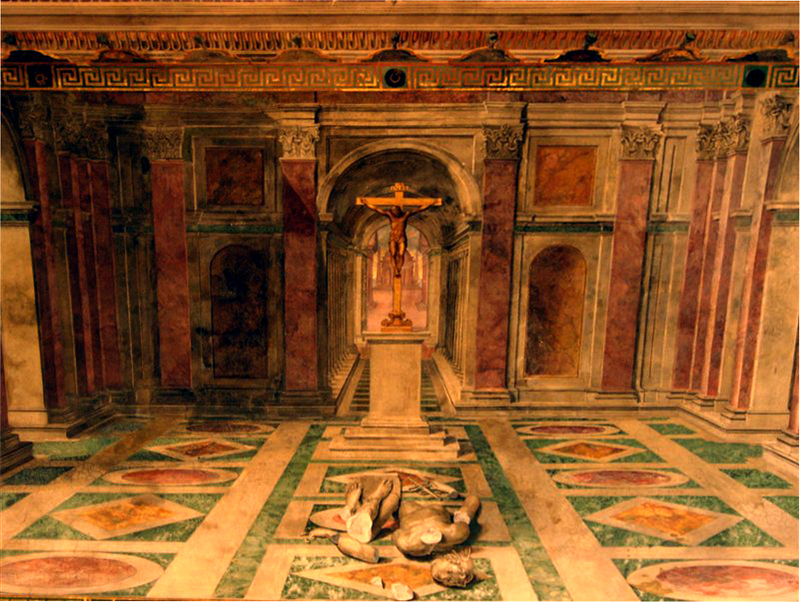 At the Vatican in particular, I found myself in both the Sistine Chapel and St. Peter’s Basilica under the spell of an awe akin to that of gazing at the stars under a perfectly clear night sky: not a square foot was devoid of a masterpiece. “Truly,” I thought, “this is one of the most impressive sights I have ever witnessed.” And while it is possible that my inexperienced senses might be easily overwhelmed, I would hazard a guess that only a brute, cold to beauty, could look upon such a scene unmoved. Looking round, unable to escape the feeling that I was incapable of the degree of appreciation due such work, my thoughts first dwelt in almost equal measure on technical curiosity (I have done only a little painting), the historical significance of such a collection, and the grandeur of the aesthetics themselves. I readily acknowledged that the skill and acumen necessary to produce something with the beauty and depth of Michaelangelo’s The Last Judgment could only be the result of true genius. But after the impress of these other contemplations had run its course, they were momentarily eclipsed by a more fundamental reflection: To what purpose is all this? For what was all this made? Was it that man might revere God, or that he might submit himself to the glory of Rome? Were such exorbitant commissions weighed solemnly against the plight of the starving? Or were Rome’s marbled halls too thick to admit of their cries? Was this “pure and undefiled religion” (1)? Does God look upon such extravagance in the name of “the Church” with favor or with contempt? I thought that what had begun as the Body of Christ had become captive to a host of ghoulish intruders: Humility had been bound and gagged, and on her throne sat a loathsome successor: Power; while Reverence and Superstition exchanged amorous glances beneath the Pope’s unheeding eyes. Truth had been drowned in holy water and garroted with rosaries, and the stench of its corpse was masked by the scent of countless candles offered to legendary saints whose cold stone visages stared fixedly upon an innocent and expectant congregation. Tradition stood tall and triumphant upon the rubble of what ought to read “sola scriptura” (2), proclaiming boldly the authority of “the Church” and beckoning all to submit on bended knee beneath her gilded scepter. The good done in the name of “the Church” (and there has been much) had been accomplished that all might stand in awe of her good graces and bow to kiss the rings on her benevolent hand. Faith she had forgotten, and Works reigned supreme. Under the weight of a withering but quiet oppression, Salvation had become a pledge of allegiance to Rome’s glory, to her “Sacred Tradition”, and to her Pope. The frescoes had turned strangely pallid before my eyes. I considered the similar perversions which had in different guises afflicted the Protestant denominations, wondering if my Reformed upbringing had in some way grafted upon me an illegitimate bias; for surely there were errors in every church (3). No, I concluded: Where heresy had crept subtly into Protestant congregations a mere Christianity (4) firmly called all to repentance. Yet here in Rome was a perverted Doctrine enthroned, honored, and worshipped; a thing of human manufacture; a deadly mix of truth and myth and lore offered at the feet of a maternal goddess. Catholicism was not all bad, I avowed, but this had made it that much more dangerous; for, like Eve, she had succumbed to a tantalizing fruit with a deadly core by inclining her ear towards an insidious serpent. Where Rome should have driven a fierce heel into the serpent’s head, she instead fed it crumbs underneath her banquet table and called it “Sacred Tradition”. Yet, there were qualities for which Rome could not be faulted. She had not embraced the common sin of either apathy or irreverence, but had simply misdirected her allegiance; nor had she fashioned Christian doctrine into an abstraction, only corrupted it in places and exchanged it with her own. I thought she had only to dethrone her false gods and she would be welcomed back from her prodigal wanderings with a chorus infinitely more joyous than even her choirs could produce. 3.) Brontë, Charlotte. Villette. London: Smith, Elder, & Co., 1853. 4.) Lewis, C.S., Mere Christianity. New York, NY: HarperCollins, 1952.